Ok, I am sure you noticed the part 1 in my title. This is because I am going to give you two recipes for melomakarona. One by Stelios Parliaros and one by Simone Kafiris. I told you before how much I admire Stelios Parliaros, not only because he is a great pastry chef, but also because his recipes are very exact and the results are guaranteed. 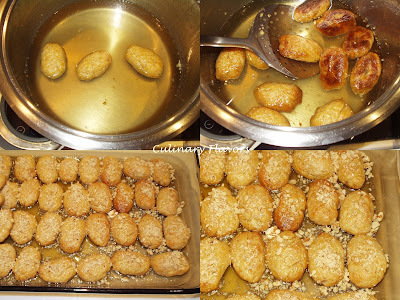 This year I used his recipe for melomakarona for the first time and as always they were great. The other recipe comes from Simone Kafiris and her cookbook “Anthologies of Greek Sweets”. This is the recipe, I use every year. Now the difference between the two, which are both excellent, is in the crunchiness. Parliaros’ melomakarona are crunchy outside and soft inside. On the other hand Kafiri’s are crunchy in and out. It’s up to you to decide. It is all a matter of liking. I can only tell you that both are tried and true. Christmas is on its way. Having a young child sure makes Christmas come earlier than ordinary. We started writing letters to Santa, who by the way in Greece is called Saint Basil, since the beginning of November. Also Christmas DVD’s and Christmas cd’s were dusted mid November. As you can understand I was in the Christmas mood willy-nilly since November. I couldn’t do otherwise. Every year, since my son grew old enough and understood what was going on around him, Christmas always started earlier for us. By the end of Christmas time, I am so overwhelmed by it, that I am glad I will have another one year until it comes again. But this fullness is not here yet and I am eager to give you the recipes for these beautiful Greek sweets. So, to give you an idea of what a typical Greek family does during that time, I will give you a brief description along with the recipe. Before Christmas we make Melomakarona (recipe follows), Kourabiedes (recipe will follow next year) and Diples (recipe will follow in my next post). On Christmas Eve, provided that you have money to spend which I highly doubt this year with this economic crisis that has felt upon us, either we go out for formal dinners or celebrate at home. Now on Christmas Day we celebrate with family. We gather at homes and make turkey with stuffing, not like the Thanksgiving, a different one. This year I am not having lunch at my home. We will go to my mother-in-law’s but I will put my mom to make the stuffing so I can post it for you. So let’s start our festivities by giving you the recipe for melomakarona. 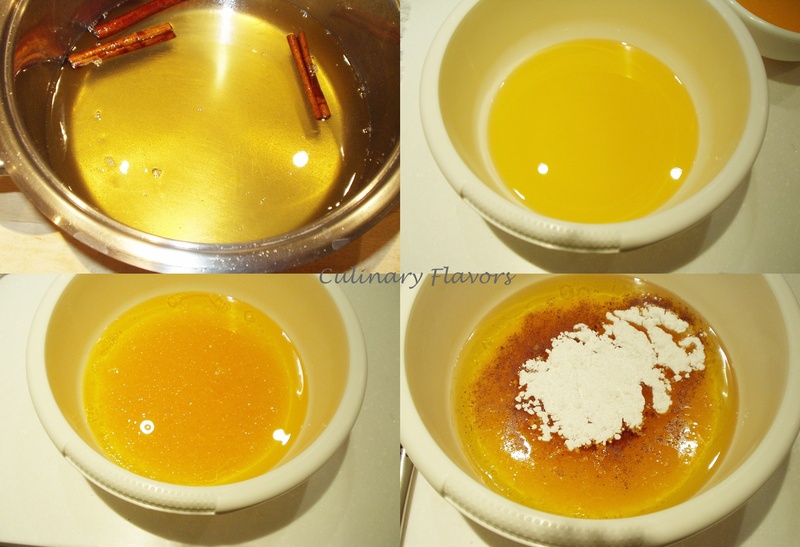 In a pot we put the water, sugar, orange and cinnamon sticks to boil. We boil for one minute and we remove from stove. We throw the honey and let it cool. In a big bowl we throw all liquids including the melted butter. We add the caster sugar and all the spices and orange zest and mix a bit. Then we throw all the flour. We mix just until everything is incorporated. Now here is the secret to success. We do not over knead. Just until everything is mixed up to form a nice dough. Otherwise the dough will become very stiff and the melomakarona will have other usage, for example, if we want to use them to open someone’s head. We take a little dough in our hands, we make it an oval and we use the cheese grinder to give the shape we want (just follow the pictures). We place them in a pan covered with parchment paper and bake in a preheated oven at 175° C for about 20 to 30 minutes or until golden. Now immediately when we take them out, we put them in the cold syrup. And let them swim for a minute. We remove them from the syrup, place them in a big plate and spur some ground walnuts on top. Not that difficult, right? I am linking this to Julie’s Family Friendly Fridays at Mommie Cooks, to Friday Potluck at EKat’s Kitchen, to Inspiration Friday at Vanessa’s Place, to Foodie Friday at Designs for Gollum, to Merry Merry Munchies at Dining with Debbie and to Twelve Weeks of Christmas Cookies at Louanne’s Kitchen. We arrived at the Fifth and Final Giveaway. I really enjoyed this very much and I am so happy I was able to offer something to you people. My only problem is that I wasn’t able to give something to all of you. But don’t you worry. When I will win the lottery, I will do that I promise! Now for this giveaway we have a package of Milk and Egg Hillopites (Square Shaped Pasta Kneaded with Eggs and Milk), a jar of Greek Sun dried Tomatoes, a package of Organic Greek Mountain Tea, a package of Krokos Kozanis (Greek Red Saffron in Filaments) and Mastic. Again entries should be made until Monday December 20th, midnight local time, which is GMT + 2. One entry per person and the winner will be announced on Tuesday December 21st. All you have to do is leave a message as always and be a follower by pressing the follow button on the right. Wow, they sound so good! Your house must smell amazing with all the cooking and baking going on! I enjoy your Greek traditions. Beautiful cookies. I love the orange in the mix. The flavor has to be fantastic. I think I'd go for the crunchy on the outside and the tender inside. My son chose Greece for his "Christmas Around the World" project and researched customs and traditions. It was very interesting to learn what others do to celebrate. I am so excited that you posted the recipe for these cookies so that we can incorporate this tradition into our family. Thank you! I loved reading about your Christmas traditions. Those melomakarona sound wonderful with the orange syrup. I cannot wait to read more! Lovely cookies… and I love the festive plate that they rest upon! I have never heard of these cookies but they sure look delicious! I must say you do come up with fantastic greek recipes that make me want to move closer to you. These looks so good, but I 've never had them, so I can only imagine and they taste fantastic. The cookies look fantastic! I really enjoyed reading about your family's Christmas traditions too. Thanks for sharing, Katerina! These look amazing! I have never heard of melomakarona but then again I'm not Greek…hehe Great giveaway too. Sounds delish! These look wonderful Katerina! Thank you for showing us how to make them – and for sharing your Christmas traditions with us. Happy Monday! these cookies look amazing! It is great to discover Christmas cookies from around the world! These cookies look beautiful. I always wondered how they got the "design" imprinted on them, and now I know–a cheese grater. Wonderful! I'm going for the crunchy outside soft inside! Looks amazing! Thanks for sharing. A perfect christmas treat!! These look fab!! Sign me up for the mixture of soft and crunchy please These look like it would be impossible to stop at.. um.. 5! Hi! Such a wonderful recipe! Cinnamon and honey…you just can't go wrong with that combination. Great recipe – have a good weekend! These cookies look great as do all the recipes you share! I love Christmas but I'm with you, I'll be breathing easy again once it's past us. What a wonderful recipe. They look delcious! I love reading about your traditions. Πολύ ωραία φαίνονται! Και του χρόνου να είσαι καλά να ξαναφτιάξεις! Και του χρόνου να είσαι καλά, καλές γιορτές. Love those melomakarona! Sounds like an interesting treat, indeed! These cookies look gorgeous! And super delicious! Thanks! These sound so delicious and I absolutely love learning about the treats from around the world at Christmastime! We have been in full Christmas mode since November 1 so I know what you mean! Thank you so much for linking up to my party this week and may you have a very blessed Christmas! Πόσα μπορώ να πάρω μια και δεν έφτιαξα ακόμα; Και του χρόνου! I love how through blogging I am able to see the traditions and food from somewhere far away like Greece that I would otherwise not be exposed to. These look pretty and sound delicious. They look wonderful. I am surprised that Parliaros uses sunflower oil. I haven't made mine yet, neither kourabiedes. I am waiting for a few more days so that they will not "disappear" before Christmas, just like they did last year and had to bake them twice. Thanks so much for sharing both recipes with us! I love a little variation. These cookie sound wonderful! 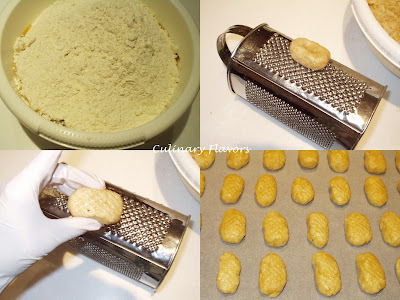 I am discovering that Greek and Lebanese cookies have something in common here, in the pressing against the grater and frying and dipping in syrup: same thing! I love that you are sharing your traditional Greek cookies. I am really excited to make these. They sound delicious. I love the flavors you use; they are different from any cookie that I have seen. They will make a wonderful addition to my Christmas cookie tray. I love learning about Greek culture– keep the lessons coming!! These cookies look amazing!! Oh those cookies look great! Yum!! I wish I had a few right now!! Oh my goodness, Katerina, these look marvelous! I wish you could send me some of those and I'd send you a big box of pralines! I love thing that are crunchy on the outside but still soft inside. I'm sure you'll enjoy these for Christmas. Κατερίνα μου και του χρόνου με υγεία. Νασαι καλά , καλές γιορτές να έχουμε. Εκανα κι εγώ χθες.. εκανε η μαμα μου κουραμπιεδες οποτε εγω δεν κάνω. I love it when you share your Greek treats with us. These look terrific! Love the crunchy and soft combination-YUM! They look delicious and I'd love to try them. Merry Christmas! Wow, these look so scrumptious! I would love to taste them, they look delicious. Thanks for sharing the recipe. Your Melomakarona look wonderful! Thank you for sharing your recipe and you have a great week end! I know what you mean about Christmas coming early when you have little ones around! We've been in Christmas mode since Thanksgiving here! These cookies look wonderful, thanks for sharing the recipe! Looking good, now you have the Kourabiedes to make!